Dine Contract Catering has a long tradition of providing its team members with formal training opportunities. November 2018 saw 3 of our Team Members from a site in Bristol all receive certificates for completing their apprenticeships. 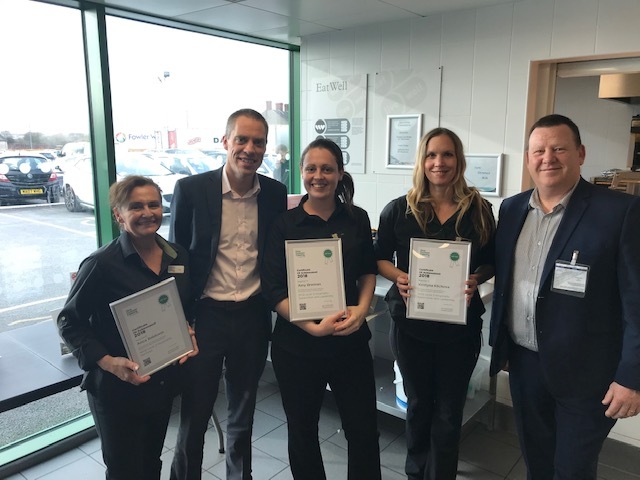 The team members pictured above joined by Talent and Succession Manager, Rob Bruford and Operations Director, Steve Kyffin took our total number of completed apprenticeships to over 200. Apprenticeships give our team members the opportunity to develop and refine knowledge and skills whilst working. They’re not just for young people though, we currently have over 30 apprentices working towards accreditations. One of our Area Managers has just started a Level 5 Management Apprenticeship and we look forward to many more team members achieving accreditations in 2019.